Saint Patrick’s Day is upon us once again, with the world’s celebration day for all things Irish fast approaching. Saint Patrick’s Day has become a truly global phenomenon, with many of the biggest festivals taking place well outside the shores of Ireland. With so many Irish nationals and people with proud ancestral Irish roots scattered across the world, this is no surprise and, in many ways, it is fantastic that everyone can come together and pay tribute to all things Irish for one day every year. In no way does that mean that you have to leave Cork for Saint Patrick’s Day, though. 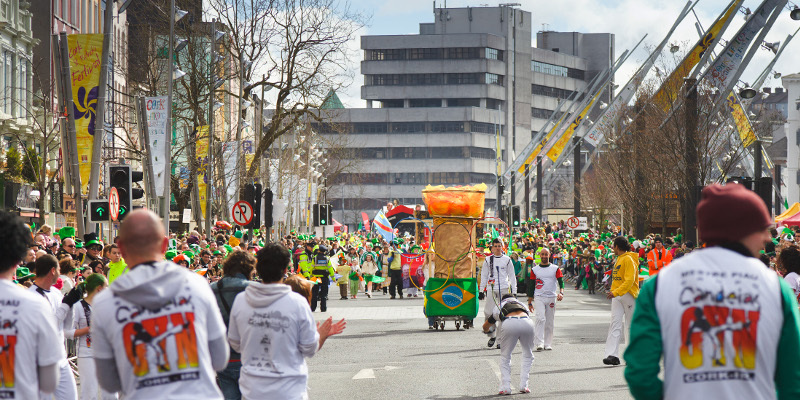 Cork is set to stage another tremendous Saint Patrick’s Day Festival for all comers, with the traditional parades marching through the villages, towns and city of Cork, as well as so many other events that will take place across Cork City and County. On March 17th, Cork will turn green for one day of the year, and thousands and thousands of people will be there to enjoy the festivities. The biggest event will be the Cork City parade, which starts on South Mall at 1pm. The parade will march right through the heart of Cork City, with a whole host of participants and surprises that will make this year’s parade even more special than the ones that have come before it. The route will follow on up through Grand Parade and Patrick’s Street, before finishing up at Merchant’s Quay, with the Cork City Saint Patrick’s Day Parade serving as the heartbeat of the city on the day. With vibrant colours and impressive displays marching their way through the city streets, the Cork City Saint Patrick’s Day Parade is not to be missed. The day will also see a series of street stalls, merchants and markets scattered around the city centre, with no shortage of great Irish gifts to pick up. Restore your strength after all the waving at the passers-by in the parade by taking in some of the great food available from the street vendors who will set up all around with great food and drink stalls in the carnival atmosphere, as the whole City comes together to celebrate the Patron Saint of Ireland. You can even enjoy the great acts on stage on Grand Parade, where the likes of The CeilÍ All-Stars and The Cosmic Funk Band will keep the crowds entertained from 10am until 6pm. The night’s events will be certain to keep the city rocking and the party going, with ceilÍs, hoolies, fleadhs and street entertainment going on around nearly every corner of the city, as Cork City becomes the life and soul of the Saint Patrick’s Day celebrations. There will be no shortage of great traditional Irish music in the cities bars, with the craic in plentiful supply. For more information on the parade and the festival events, please go to the Cork Saint Patrick’s Day Festival website.